The sentences just don’t want to flow. My brain feels likes like mush, and fatigue steals the words off my tongue. But I expected it this time. In fact, I even tried to prepare for it. Yet here I sit, dizzy, and exhausted…after a full night’s sleep, at 11:00 am. It’s been a hard week to say the least, and this time, Meniere’s is not to blame. Well not directly. It all started with a simple accident, one careless moment while preparing dinner several weeks ago. I was in my kitchen on a Friday night, and had decided to cut up an avocado. I sliced it in half and began to cut out the pit, when the knife slipped and went straight into my left thumb. It was a small cut, but it went in deep, and I immediately knew something was very wrong. As I ran my thumb under the faucet, I couldn’t feel anything. The top of my thumb was completely numb. I sealed the cut closed with liquid bandage and hoped for the best. A week later, the cut was almost healed, but I still had no feeling in the top of my thumb. I decided to see a doctor. After considerable searching for a local orthopedic hand specialist who accepted my insurance, I was able to book an appointment for the next day. I’ve had trouble finding good doctors in the past, but this time I got lucky. The doctor couldn’t have been nicer or more patient. He answered all of my questions, but after an X-ray and physical exam he broke the bad news. I had damaged one of the nerves in my thumb, possibly severed it, but there was no simple way to tell. He explained that there are no tests sensitive enough to be able to see the damage on a nerve that small. The only way to know for sure, and fix it if need be, was exploratory surgery. The situation had escalated so fast. My doctor explained that, depending on the severity of the damage, the feeling might come back on its own, but there was a chance it never would. And even if it did, scar tissue could develop around the nerve and cause problems later in life. I also didn’t have a lot time to make a decision. The longer I waited, the less effective surgery would be. I decided later that night that if I didn’t get the surgery, and the feeling never came back in my thumb, I would always regret it. I scheduled the surgery the next day. This was my second surgery in the last year alone. About nine months ago I had to have a surgery to repair a hernia. So I had a rough idea of what to expect this time around. After my hernia surgery, I had a really difficult time. I was hit by a mountain of brain fog, fatigue, and dizziness that had threatened to crush me. My Meniere’s symptoms had returned with a vengeance. The accompanying exhaustion, boredom, loneliness and resulting depression had lasted for weeks. One of the most powerful forces in treating Meniere’s disease is forward momentum. Before I had my hernia surgery, I was working on exciting projects, exercising and meditating every day, and eating a healthy diet. I had so much momentum behind me. But then I had the surgery. I was in pain, doped up from the meds, eating comfort foods, and laying around all day. When it came time to transition back into my life, I was stuck. It was the first time since becoming diagnosed with Meniere’s disease that I had reached a point of complete inertia. I’ve had my share of setbacks over the years, but I had never been so completely out of commission. It took me a long time to find my way out of the hole. It took so much effort to get the ball rolling again. So when I scheduled the surgery for my thumb, I wanted to try to avoid a repeat of the aftermath of my last surgery. I made a plan, and although I’m having a tough time, it’s nothing like it was before. Life always gets in the way. 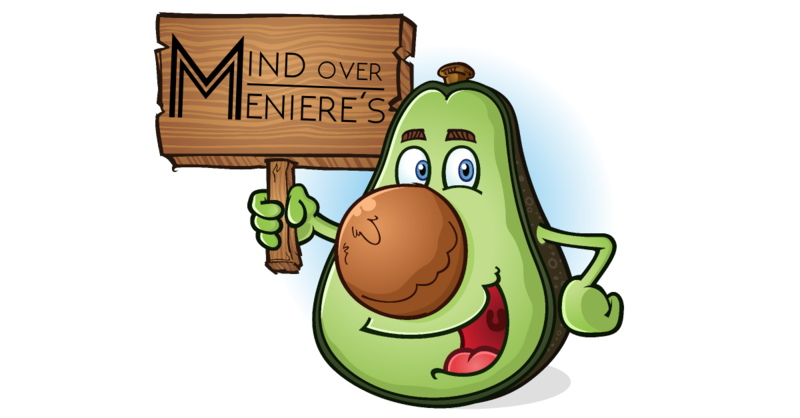 We not only have to face the adversity of Meniere’s disease itself, but we also have to face adversities with Meniere’s disease. Often, we have to deal with both at the same time. But every once in a while, we know what’s coming, and we get a chance to prepare. My avocado disaster was ultimately an accident, but the damage was done. All I could do was accept that it happened, and get it taken care of. This time though, I knew the challenge was to prevent inertia. After my hernia surgery, the brain fog was so thick I could barely function. It dragged on for so long. I was starting to lose hope. At some point I realized that it wasn’t going to improve on its own. I needed to do something, anything, to try to get better. It was time to take action. I focused what little bit of energy I had on two key tasks: creativity exercises and rebuilding my routine. It was hard, really brain-achingly difficult. But I would finish a story and for a short while I would feel amazing. I had created something new and accomplished something I never knew I was even capable of. And the fog slowly started to lift. Every day I felt a tiny bit better. I also started to try to rebuild my routine. I started eating my meals at the same time again, and I cut out the junk food. I couldn’t exercise, but I started going to bed and waking up at the same time every day, making sure to get 9 hours of sleep. It was an agonizingly slow process, but eventually I bounced back. To keep up momentum after my thumb surgery, I knew what I had to do. I kept the junk food to a minimum. I went to bed early and got more sleep than I usually do. And I kept up my daily creative practice. As hard as it has been to write, I am feeling better now than when I first started writing this article. Despite my best efforts, it has still been a hard week. But I am grateful to have learned my lesson the first time around. I was prepared and that preparation paid off. After only a week, I am already starting to feel better. I hope I don’t need surgery again for a long time, but I know that at some point, somehow, something will go wrong. And when it does, I’ll be ready. Previous PostNicotine-Dopamine Connection-Smoking Part 2Next PostRX FOR THE SOUL.